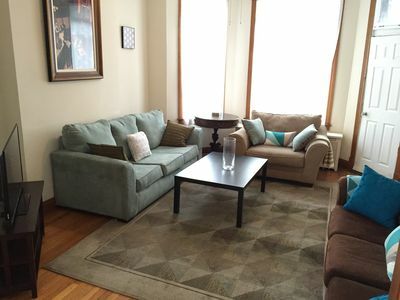 Minutes to Downtown - House for 6! When given the option to sell our wonderful place, we decided that we loved it to much to not share it with others! Its a no fuss, updated home that is beautiful and airy with all of your basic living amenities. •Bedroom 1 - Queen Size bed. • The beds have fresh, clean and crisp linens and the bathrooms are stocked with fresh towels, shampoo, conditioner, and body wash.
•Living room lounge with big screen for DVDs. 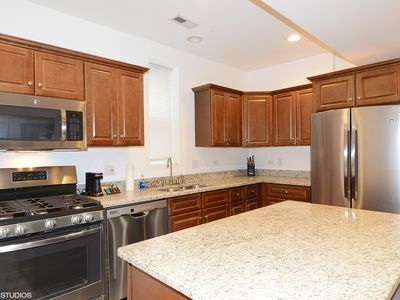 •Fully stocked kitchen with updated appliances, coffee maker, etc. •Washer & Dryer in property. •Iron, ironing board, hair dryer, ample closet space with hangers, etc. 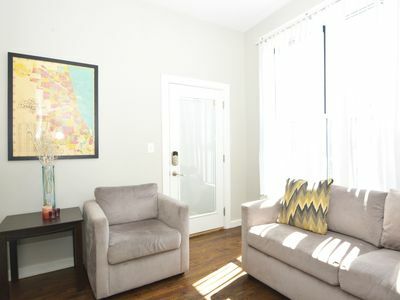 Modern 2 bedroom apartment, in the heart of Humboldt Park. 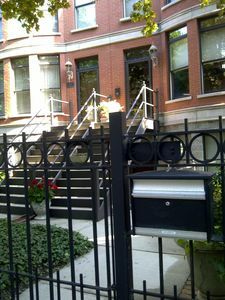 Situated between up and coming Wicker park and Logan Square. 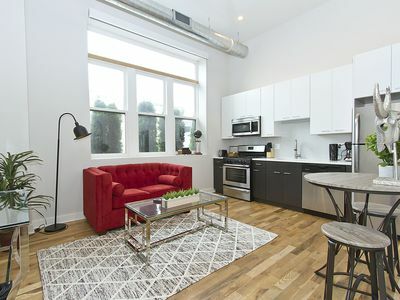 Be in Downtown Chicago within minutes. Walk to amenities. Experience Chicago, while having all the comforts of home. 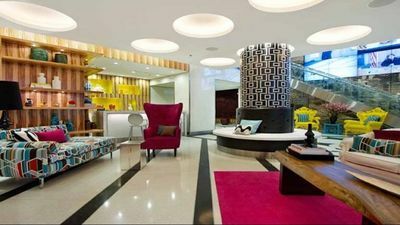 Why Stay in a cramped hotel room when you can stay in a large 750 sqft apartment fully furnished apartment. Comfortable sleeps 4 but can accomodate up to 6 people. Additional off street parking can be arranged for 2 cars or more for additional charge. I travel often so I use and trust an off-site management team to help guests get the information and service they need to make their stay enjoyable! They will be your contact for all communication leading up to and during your stay. Direct Bus access to Downtown areas Like Oldtown, Streeterville, Rivernorth, and Loop is a 5 minute walk away. 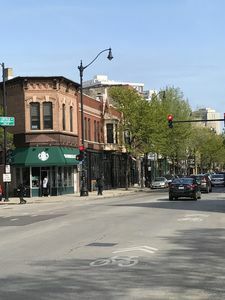 Walk (30-40 min) or bus(10-15 min) to Culture Rich areas like Wicker Park, Logan Square, or West Town. 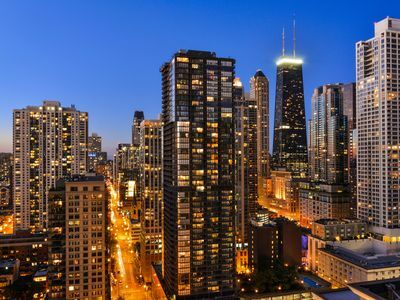 Downtown Chicago Areas like Lincoln Park, Streeterville, Rivernorth, and loop are a 10-15 minute car ride. No Car? No Problem! UBER and taxis are readily accessible all over town. UBER Car Service : Highly recommend this. Uber cars are always in the area. Bus Access: Bus stop is a short walk from W. Lemoyne to N. Kedzie near Lincoln Park or to W. North Ave. Plenty of maps online for bus/train stops. Train Access: The “L” train (Or CTA subway system) can access Chicago Areas such as Rivernorth, Streeterville, The LOOP via the Blue line. The Blue line can also bring you directly to Chicago O’Hare International Airport. The Blue Line can be accessed from Logan Square (1.5 Miles away) or from Wicker Park (1.8 Miles Away). Both Great Areas to visit during your stay. Bicycles by Divvy: Another Popular and cheap form of transportation around Chicago is the Park-n-go bicycle system will locations all around Chicago. Rent a bicycle all day for as little as 7 dollars and explore the city and is neighborhoods at your leisure. 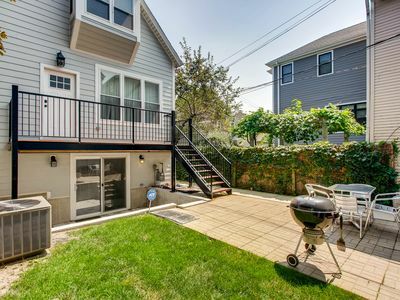 Humboldt Park is the hottest neighborhood in Chicago, and the 10th hottest in the nation according to real estate listing site Redfin's annual top ten list of "Hottest Neighborhoods". Humboldt Park itself totals 219 acres and features a field house with fitness center, two gymnasiums, meeting rooms and an inland beach. Additional green features of our facility include: an artificial turf soccer field, junior soccer field, lagoon, a replica of the Chicago Cubs stadium, “Little Cubs Field,” and a stable building, now the Puerto Rican Arts and Culture Museum and baseball fields, tennis courts and playgrounds. Park-goers can play baseball, soccer or tennis at the facility. On the cultural side, the Park is host to the Latin Jazz Festival, the Puerto Rican Festival. In addition, Humboldt Park hosts fun special events throughout the year for the whole family. 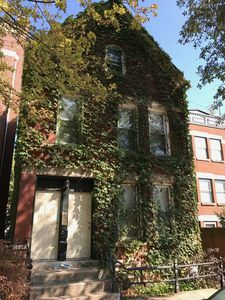 With the support of the community, Puerto Rican leaders in Chicago leased the historic Humboldt Park stables near Paseo Boricua that house the Institute of Puerto Rican Arts and Culture. It is the only museum in the nation that is completely dedicated to the history of Puerto Rican culture. PERFECT FOR LARGE GROUPS!! SLEEPS 26!!! 13 Queen Beds and 5 FULL BATHS! 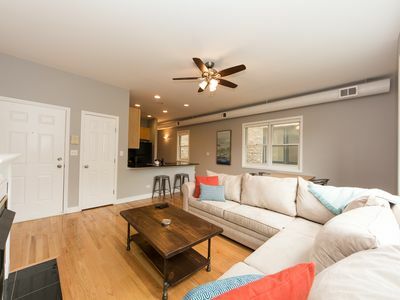 Amazing Wrigleyville 4 bed/ 2 bath 1 block to Wrigley- AWESOME WEEKDAY SPECIALS! 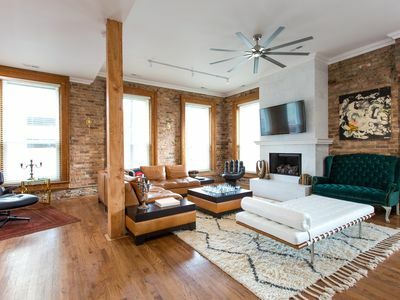 Luxury Downtown Chicago Loft. Free WiFi. Pets Friendly. Fire Place. Roof Top.